If you’re a teacher, this title might have taken you by surprise. Teachers and entrepreneurs? What kind of business can teachers do? Sell their lessons? Well, in fact, yes, and much much more. Actually, you can be a successful businessperson and very easily. As you have taught students, you have gained several skills that will help you open your own startup. Teachers work with a certain objective in mind. It is the focus that drives your course and lesson plans. Meeting daily objectives is difficult and many teachers hate it, but they have to do it. It forms a habit and they get to be clearer in their goals and objectives of the month and the semester. When you start a business, you need to be focused towards your goals. Many people fail in their businesses because they lose focus and interest very soon. As a teacher, you know how to stay there and keep it going. As a teacher, you need to work with students who come from different backgrounds. It takes patience to discipline them. There are difficult people and you know how to deal with them patiently. This helps you work with all kinds of clients. You know how to handle tricky situations, which other people cannot do. When you teach your lessons, you need to break them down to your students. This builds your ability to simplify complicated issues. This skill helps you during presentations and conferences where you can talk more easily to people and help them understand your idea. You can break complicated things down into digestible chunks for others to understand. As a teacher, you have handled students without losing patience. This makes you a better manager than the others. You have the ability to motivate and discipline your workforce without being too pushy. You can get deadlines completed on time. This can give you success in your business. Teaching gives you unique skills that help you immensely in real life. Whether you’re looking for a job or want to start a company, these skills will help you go high in your career. That’s it for now Busy Educator. 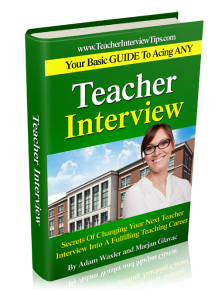 Stay tuned for the next video “How to Prepare For Your Teacher Interview”. Until next time, Talk to each other, support each other, take care of each other.